As we get going on seasonal planting etc, now is the time to consider our fellow creatures. 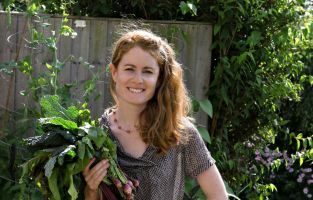 Gardening writer and TV presenter Alys Fowler is offering British gardeners top tips to help our bees, as part of Friends of the Earth’s Bee Cause campaign to save vital bees that pollinate our food and make our countryside, parks and gardens thrive. Gardeners are also being asked to help urge the Government to strengthen its plans to protect Briatain’s bee populations. More than 20 UK bee species are already extinct and a quarter of those remaining are at risk – due mainly to their food and nesting sites disappearing, with 97% of wildflower meadows gone in the last 60 years. Gardens are becoming one of the most important refuges for Britain’s wild and honey bees, providing chemical-free food, clean water and a place to nest.